When New York Harley-Davidson dealer Asaf Jacobi needed to increase his lagging winter sales, he turned to artificial intelligence to measure, and then autonomously optimize, the outcomes of his company’s marketing campaigns. Following a friend’s recommendation, Jacobi tried out Adgorithm, an AI-powered automated marketing platform. Algorithm’s AI engine analyzed Jacobi’s CRM data to identify the general makeup and habits of his best customers, then identified leads who shared these characteristics. Eventually, Jacobi was able to successfully pair these leads with customized marketing content designed to appeal to their buyer profiles. The result was that Jacobi’s qualified leads increased, on any given day, from one to 40, while his sales increased from one or two motorcycles sold per week to 15 in one weekend. After three months, leads had increased 2,930 percent, and Jacobi had to set up a new call center and hire six new employees to keep up with demand. Jacobi’s story illustrates the power of AI as a tool for increasing sales engagement. Here are three ways artificial intelligence is helping companies achieve superior sales performance. One useful but obvious way AI is boosting sales engagement is by helping marketing and sales teams uncover qualified leads. Jacobi’s deployment of Adgorithm is a case in point. Adgorithm developed a profile for Jacobi’s ideal prospect by identifying the characteristics of his top customers hidden in his CRM data. 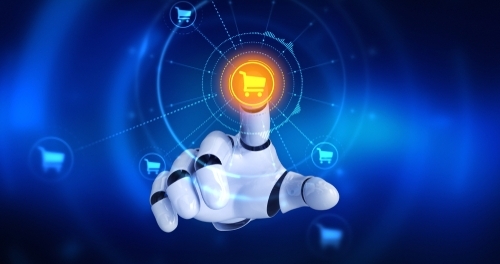 Through the automated marketing platform, Jacobi was able to isolate variables such as which customers had spent the most time browsing website content, which had added items to their shopping carts, and above all, which had completed a purchase. Indeed, this is a prime example of how AI tools can develop ideal buyer personas by mining data from sources such as CRM databases or social media. AI marketing guru Venkat Nagaswamy is another success story. Nagaswamy, CEO of AI-powered marketing startup MarianaIQ, was able to analyze leads from 5,000 companies in order to identify which prospects represented a good match for his client’s ideal buyer. Whereas a traditional analysis of the list of prospects only identified qualified leads at a 15 percent accuracy rate, using AI boosted this to 81 percent accuracy, yielding 16,000 leads from a list of 20,000 names. Another way AI is boosting sales is through the automation of customer engagement, allowing sales and customer service teams to assist more customers around the clock. For example, many businesses are turning to AI-powered recommendation engines to automatically suggest opportunities in order to upsell and cross-sell customers. Companies like Netflix and Amazon pioneered the effective use of recommendation engines, which now generate as much as 85 percent of Amazon’s total revenue. Not only that, but personalized recommendations now account for over a quarter of all retail sales revenue. But AI is also boosting customer engagement by allowing companies to proactively anticipate customer needs and meet customers during parts of the sales cycle in which they feel most comfortable. Today’s cutting-edge cloud contact center solutions use AI to streamline customer support tickets by comparing a customer’s identifying information to CRM data about their account history. Ultimately, this makes it possible to predict customer needs and present them with a list of customized support options. Plus, AI-powered cloud contact center software can proactively anticipate when a customer needs assistance, allowing live agents to follow up to inquire whether the customer has questions or issues. For instance, a pharmacy’s AI contact center can predict when customers need to refill their prescription and automatically schedule a reminder via phone or text. AI is also increasing sales engagement by making it easier for companies to communicate through a customer’s preferred communications channels. These days, customers increasingly prefer AI-assisted self-service options over calling or chatting with a live agent. In particular, two-thirds of individuals now prefer self-service to traditional service channels, while 4 in 10 only resort to calling a support line if they’re unable to make headway via automated prompts, according to CRM magazine. Additionally, users appreciate AI-powered self-service for its speed and their ability to multitask while answering the automated prompts. In addition to providing favored support channels, AI allows companies to analyze which channels a customer prefers based on an analysis of their past communications. Companies can then reach out to customers through their preferred support channels, thereby improving satisfaction and promoting retention. AI can empower companies to uncover new sources for qualified leads by analyzing buyer personas. But there’s more to this story. To better promote customer engagement, AI tools use predictive analytics to anticipate a customer’s needs and optimize customer engagement by providing answers and feedback on channels that customers prefer. By making it easier for companies to locate, serve and communicate with customers, AI is laying a foundation for enhanced customer engagement and accelerated sales growth.